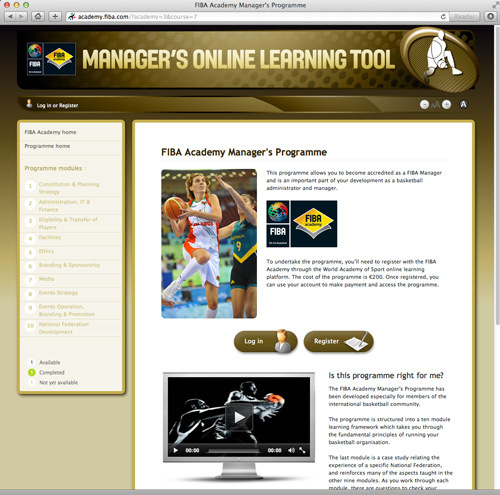 The FIBA Academy - The education arm of the International Basketball Federation (FIBA) has today announced the launch of its new basketball specific management education programme, The FIBA Academy Manager's Programme (http://www.fiba-academy.org/). This unique education initiative is now available to FIBA's 213 member National Federations, and the wider basketball community. The programme sets out the fundamental principles of the FIBA National Federations Manual into an online interactive learning programme; with the aim of bringing best practice management, leadership and administrative techniques to the forefront of the sport. All successful students in the programme receive a certificate from FIBA Academy and thereby become an accredited FIBA Manager. FIBA members receive one complimentary scholarship each. The programme's ten modules cover three key themes: Administration, Marketing and Events. It also includes a case study which highlights the integration of these topics into the review of a National Federation. Depending on the student's prior knowledge of sports marketing and management, the program can be concluded in between three and six days. With this programme, the National Federations' work will be more organised, more ambitious, and will serve the betterment of the international basketball community. At the same time the programme offers a unique learning tool to be included in University Undergraduate programmes and club development initiatives worldwide as FIBA continues to extend the reach and influence of basketball as the Global Sport. Patrick Bauman, FIBA Secretary General, commented: "The FIBA Academy Manager's Programme represents the logical next enhancement to our National Federation Manual. The programme brings the manual to life as an online learning tool that will make learning more interactive and informative for our National Federations and their many clubs". "We are also excited about the ability for Universities and learning organisations from all over the world to integrate this programme as a sports management subject into their curriculum as we continue to grow the reach of our game. Ultimately, we would like to see all sports science and management graduates with a FIBA Academy Manager's certificate," he added. Chris Solly, Director of the World Academy of Sport and the FIBA Academy said of the initiative, "FIBA has shown great vision in the development of this programme and the ability for it to provide tailored support for the National Federations in order to develop leadership and management capability. At the same time it provides a ready-made tool for them to offer Universities and learning providers in their respective countries to further grow the influence of basketball worldwide and clearly demonstrates to governments that basketball is a great investment through its commitment to developing human capital." One of the students to already pilot the programme is Jim Tooley, CEO of USA Basketball and Vice President of FIBA Americas, who said: "I would like to thank and congratulate all those involved in starting this valuable program for the betterment of our international basketball community." The FIBA Academy is the educational division of the International Basketball Federation (FIBA) and is managed by its foundation, The International Basketball Foundation (IBF). It was established in 2008 to deliver 'Best Practice' academic programmes, in order to ensure that FIBA athletes, managers, and event organisers from across the globe have access to the highest quality education and is a partnership programme with the World Academy of Sport.